Sibel Alpaslan, Erin Finney, Peter Happny, and Kathleen Litchfield represent a small portion of area artisans whose work warms the winter season with color, movement, and the fire-kindled nature of craft. We are lucky that their work—as well as the work of hundreds of other artists—flows into Concord as if it were the millpond that the state’s creative wellspring feeds into. SIBEL ALPASLAN’S ORNAMENT, PEACE, WAS SELECTED BY THE NH LEAGUE OF CRAFTSMAN AS IT’S ANNUAL 2018 ORNAMENT, THE FIRST TIME A CERAMIC ORNAMENT WAS CHOSEN IN 31 YEARS. Sibel’s handmade porcelain, white clay, and stoneware is the first ornament chosen by the League of New Hampshire Craftsmen as its Annual Ornament to use clay as one of its media in 31 years. The inspiration for the piece, notes the Turkish-born artist, is the inherent beauty and lyrical symbolism of doves, which have been an important motif in her work. “I think they are fascinating, magical creatures,” Sibel says. “Maybe it’s because I come from a city on the Aegean Coast of Turkey called Kusadasi [near the ancient city of Ephesus], where there is a small island just off the coast that’s name means ‘Bird Island’ because it is a popular place for birds during their seasonal migrations. 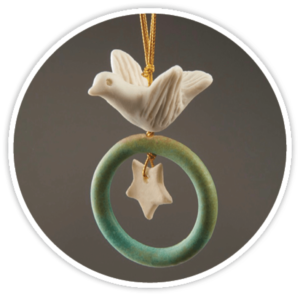 For each ornament the artist fashions a dove out of white porcelain clay, uses a turquoise color to meld the green of Earth’s landmasses and the blue of its oceans, and adds a porcelain star as a nod to her new homeland, America. 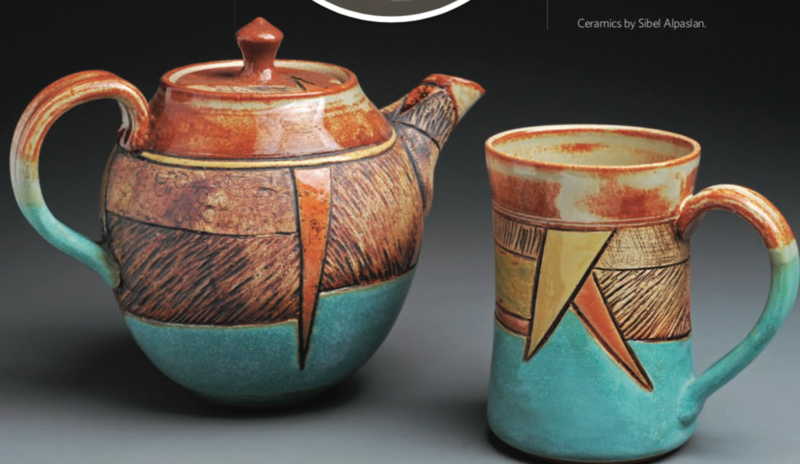 Additionally, teapots and cups are part of her ceramic repertoire; a most warming antidote to ward off the season’s chill. 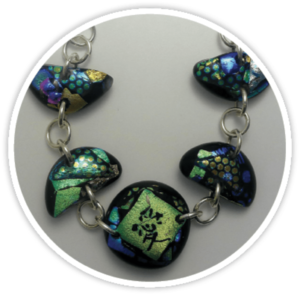 ERIN FINNEY’S LOVE BRACELET FEATURING THE CHINESE SYMBOL FOR LOVE IS HAND-ETCHED IN DICHROIC GLASS AND COMBINES INDIVIDUALLY CRAFTED FUSED GLASS BEADS WITH STERLING SILVER COMPONENTS. Erin is a retired Conway Elementary School special education teacher who in her off hours explored creative outlets such as pottery and quilting. It wasn’t until her husband took a stained-glass art class 20 years ago that she began exploring designing and firing colorful glass. 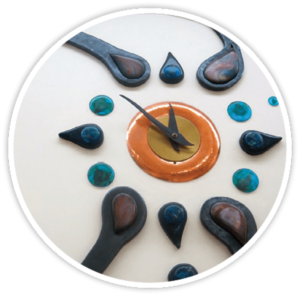 Like many enduring artisans, she’s followed the shifting streambed of her craft, from creating flat glass pieces to artfully fired and designed jewelry. She is also noted for her mosaic work, having studied with distinguished muralist David Fichter of Cambridge, Massachusetts. The two worked together as part of the Tamworth 250th Community Mural project. In 2013, Erin was awarded a scholarship by the League of New Hampshire Craftsmen to study under free-form muralist Isaiah Zagar of Philadelphia’s Magic Gardens in a mosaic mural workshop. PETER HAPPNY WORKS IN MANY DIFFERENT ARCHITECTURAL STYLES, INCLUDING COLONIAL ART NOUVEAU, GOTHIC REVIVAL, ARTS AND CRAFTS, ART DECO, AND CONTEMPORARY IRON WORK. The utilitarian, sturdy features of his hooks and candlestick holders harken back to traditional metalcraft. But the elegant, jewel-like finish he evokes in his glass-and-iron chandeliers and suspended glass-and-iron plant holders define their beauty and artistry. Peter is a gifted artisan who often collaborates with other artists. These works exhibit a precise dovetail and understanding of metalworking paired with other art forms and media. 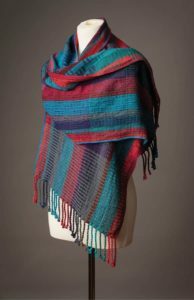 Master weaver Kathleen Litchfield designs and hand-weaves colorful, warming scarves, shawls, and ponchos in rayon, chenille, mohair, merino wool, and Tencel using a variety of looms including a Harrisville, Macomber, Schacht, and an eight-harness cherry Norwood model. She discovered her passion for the craft at an early age after a chance encounter. uKATHLEEN LITCHFIELD’S HAND-WOVEN SCARVES, SHAWLS, AND PONCHOS INSPIRED BY THE BEAUTIFUL HILLS OF WESTERN MASSACHUSETTS ARE MADE FROM RAYON, CHENILLE, MOHAIR, MERINO WOOL, AND TENCEL. Kathleen followed her calling, became a juried member of the League in 2016, and earned a master’s certificate in weaving this year. She traces her design inspiration to travel and nature. All four are juried members of the League of New Hampshire Craftsmen. There work can be found here in Concord.